It’s been a couple long, busy weeks here at the GEMM lab as my field season has wrapped up and new labmates are just getting started. There are students in the lab at all hours organizing, processing, and analyzing data. Much of our work investigating the spatial and temporal patterns of marine mammals around the globe takes long hours of parsing through information to bring you results. Systematic sampling is an important research tool but, sometimes, exciting discoveries just wash up at your front door. 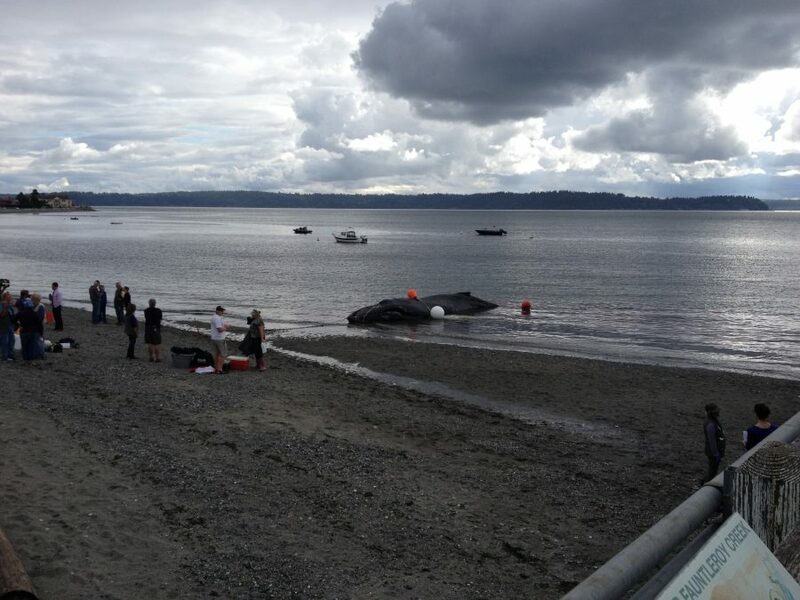 Just recently on August 7, 2016, a 39 foot, juvenile female Humpback whale stranded at the Fauntleroy Ferry Terminal in West Seattle, WA. This is very close to my home town, and a recent GEMM lab intern was in the area at the time, so we have a photo of this event for you! The humpback came ashore while still alive, but despite efforts to keep it comfortable and wet, the whale died before the tide returned. A cursory necropsy, conducted on site by researchers from NOAA fisheries and the Cascadia Research Collective, showed the animal had multiple internal parasites and injuries associated with beaching, as well as being in poor nutritional condition overall. There were also bites on the lower jaw consistent with killer whale encounters, and a pod of orca had been spotted in the area the previous day. Necropsies are an important source of data about the basic physiology and biology of marine mammals that is not accessible through any other means. The carcass was towed to a deep-water disposal site approved by federal and state agencies and sunk. Humpback whale sightings in the Salish Sea have increased in the last five years. This, together with the fact that this juvenile was in poor nutritional condition, could indicate that there is competition for resources. There have been two new species of cetaceans discovered in recent months! 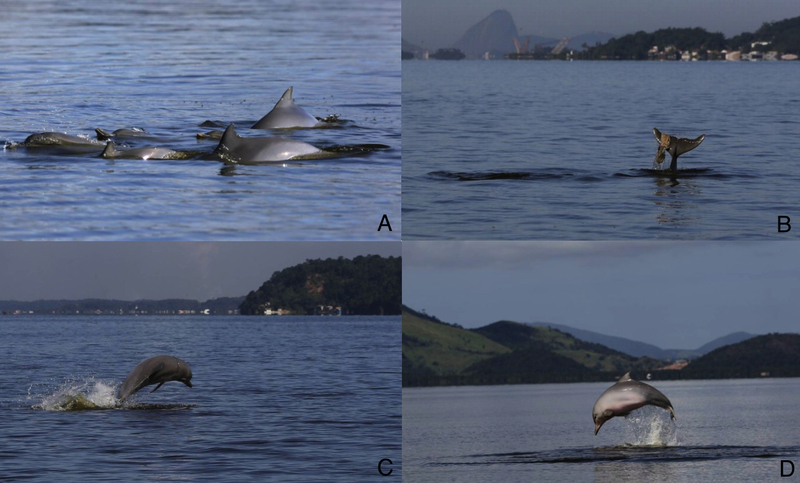 The first exciting announcement was published in the journal Marine Mammal Science in July. 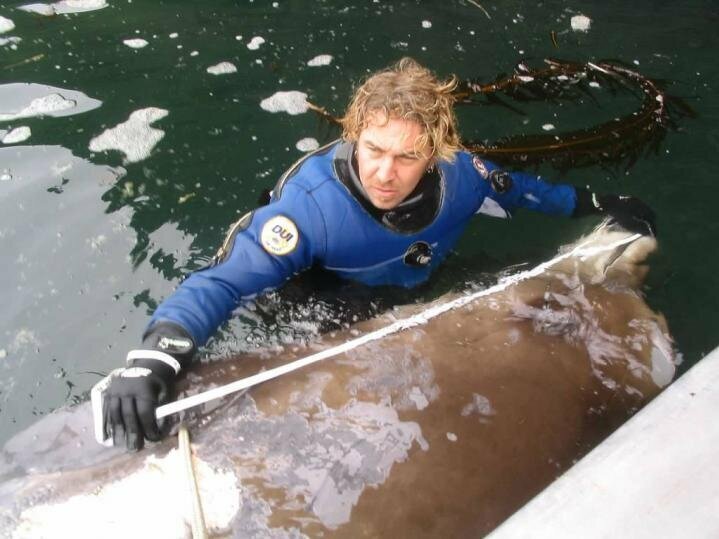 Japanese fishermen in the North Pacific have long reported a small, black beaked whale they call karasu, “raven.” In 2013, Japanese researchers published a paper about this black, beaked whale variant of the sub-family Berardiinae using three stranded carcasses, but the sample size was too small to make any conclusions. Three years later there is strong genetic evidence that this is a new species of beaked whale based on (1) genetic analysis of samples from a stranded animal on St. George, Alaska (2) skeletons in a high school in Unalaska, Alaska, (3) skeletons in the Smithsonian archives, and (4) skeletons in other museum and institutional collections around the Pacific Rim. 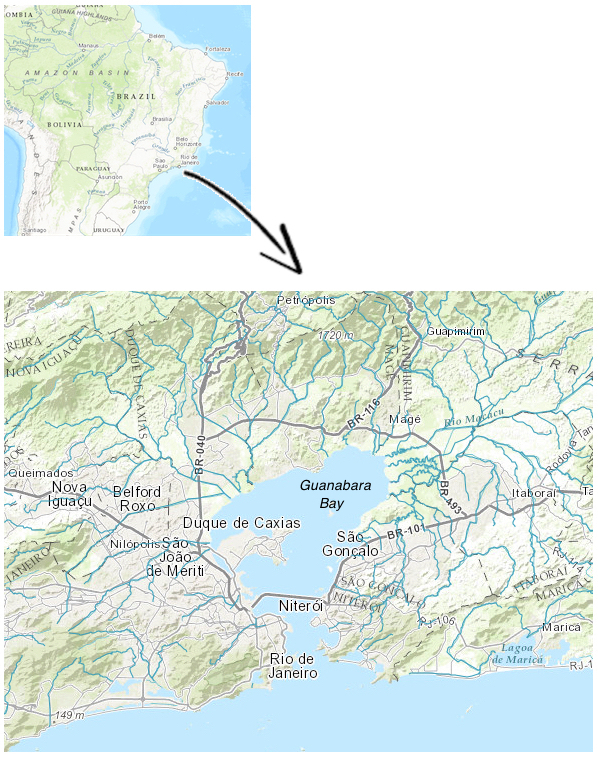 The species still needs to be described and named, but some researchers have suggested Berardius beringiae to honor the sea where it was found. What do you think? The second announcement of a new species came from the Smithsonian Institution earlier this month. A skull of the newly-named Arktocara yakataga species was found more than 60 years ago near the present day city of Yakutat, Alaska. Obviously belonging to a prehistoric dolphin, the skull was kept at the Smithsonian’s National Museum of Natural History until new research found that it was actually a previously undiscovered species. A. yakatoga is thought to be a relative of the present day South Asian River Dolphin, and is both the northernmost, and one of the oldest dolphin fossils found to date. This new find is a reminder to everyone that not all discoveries are made in the field. Museum and archival collections continue to play an important role in the advancement of science and knowledge. Check out the link above to see some awesome artistic renderings of the new species, as well as a 3D scan of the skull in question. Sounds like the next big B-Sci-fi movie doesn’t it? Well, this story is the latest to go viral on the internet. 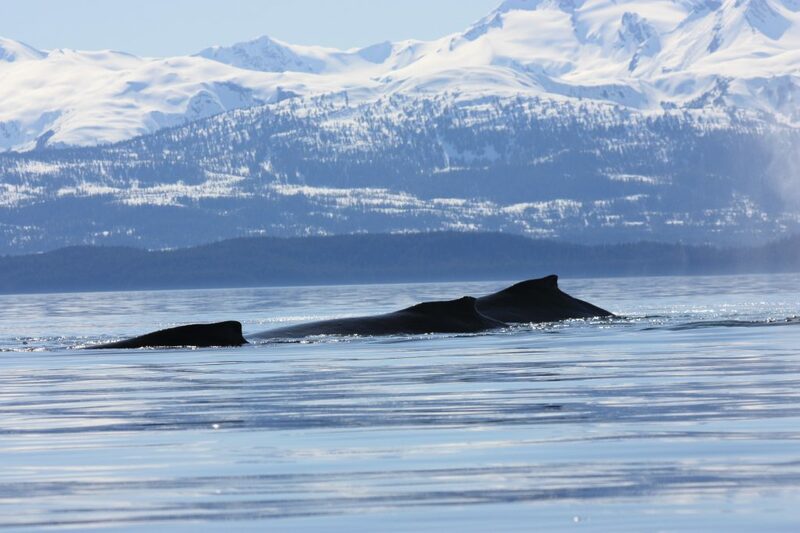 Published on July 20, 216 in the journal Marine Mammal Science, the study investigated accounts of humpback whales interfering with killer whale attacks. Researchers looked at 115 interactions between the two species. Humpbacks initiated 57% of the interactions, and 87% of these moments occurred when the killer whales were attacking or feeding on prey. Surprisingly, only 11% of the prey in these events were humpback whales, while the remaining 89% ranged from other cetaceans to pinnipeds, to a sunfish! The authors suggest that the humpback whales were alerted to attacking killer whales in the area by vocalizations, and that this attracts them to the scene regardless of the species being attacked. Although kin selection (care for or defense of relatives to preserve your family’s genetics even though the action may be detrimental to self), or reciprocity (exchange between individuals for mutual benefit) might explain some of this behavior, the fact that humpback whales so often defended other species means that we cannot rule out the possibility of altruistic behavior. This is a pretty fascinating read, and definitely opens up some new questions for researchers! Recapping and Reflecting on the International Marine Conservation Conference! 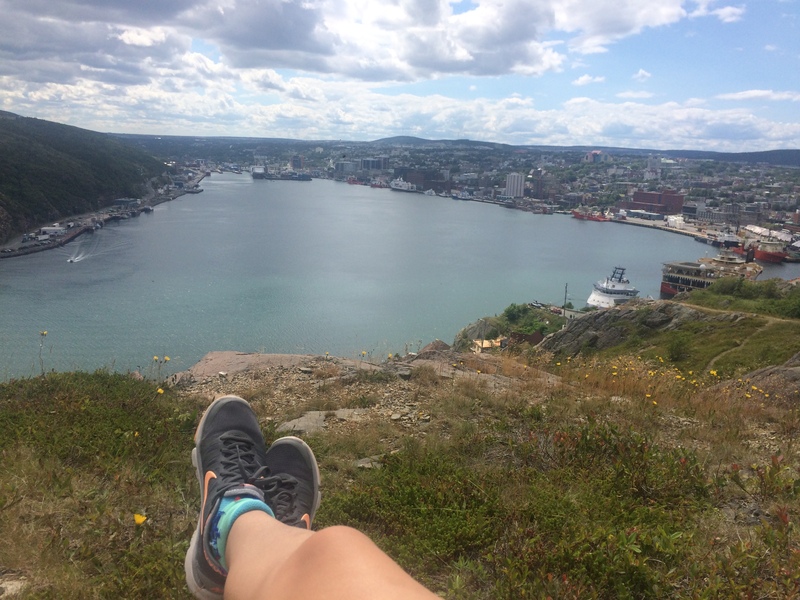 The GEMM Lab recently returned from the 4th International Marine Conservation Congress (IMMC4) in St. John’s, Newfoundland, Canada, and it was a whirlwind of activity to say the least. The flights were long and the morning coffee was scarce, but the setting was beautiful and plenty of scientific fun was had! The IMCC conferences are the largest international academic conferences on marine conservation and the theme of this year’s conference was to “Make Science Matter”, or in my interpretation “to use conservation science to drive policy change and implementation”. Over five days we were exposed to a flood of new ideas, hypothesis, methods/techniques, analyses and findings – even presenting our own! Leigh, Florence, and I were all slated to give a talk on the opening day of presentations. Leigh presented on her new method for analyzing animal movement data in space and time, Florence on the effects of vessel activities on gray whales, and myself on the habitat use of harbor porpoise off of the Oregon Coast. The conference was filled with non-stop talks, lunch sessions that incorporated workshops, student activities with plenary speakers, and an evening activity planned for every night. 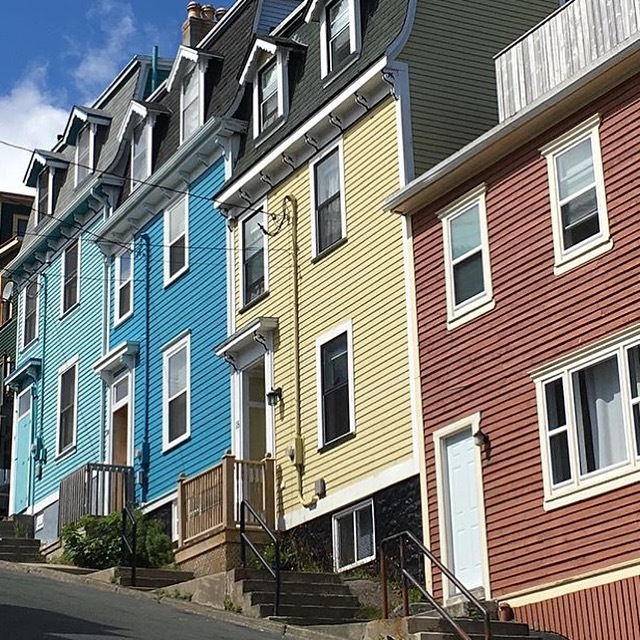 Short breaks during the conference shenanigans allowed for some exploring of the St. John’s area including Signal Hill, Cape Spear, and the George Street Festival. Highlights included humpback mom and calf, fin whales (my first time seeing them), dozens of seabirds I wish I could identify and some popular Canadian music. 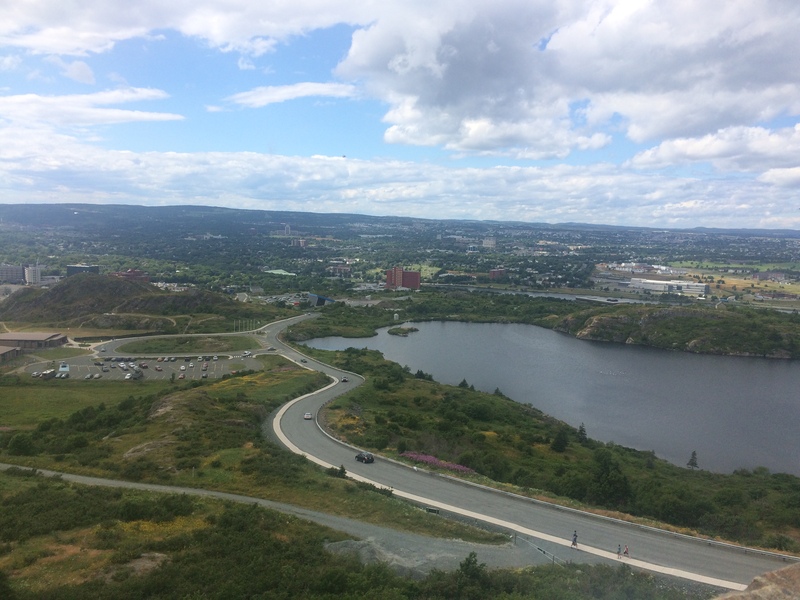 View from Signal Hill, where the first transatlantic wireless signal was received in 1901. 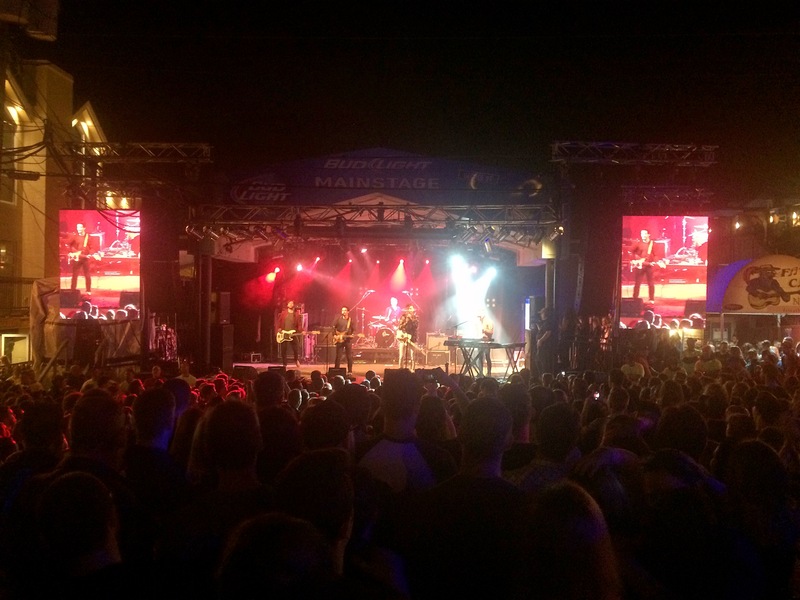 The Arkells playing at the George St. Festival. 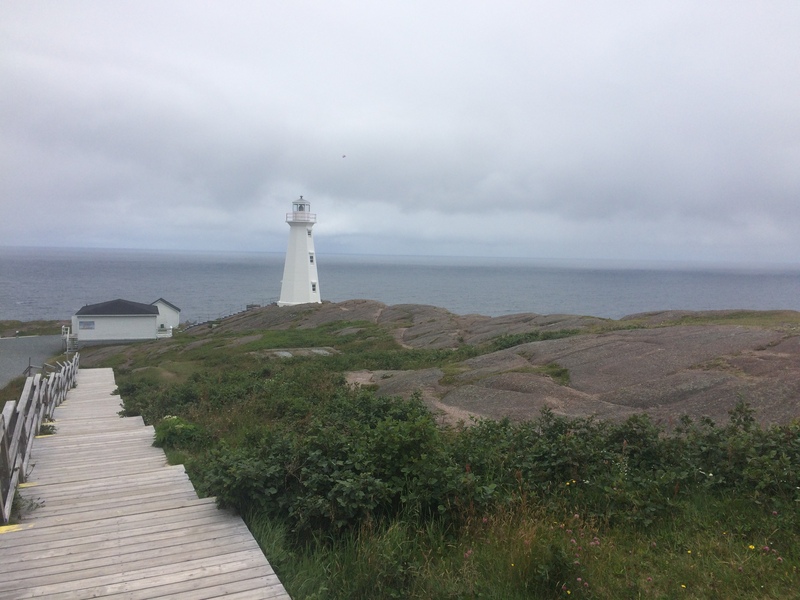 Light house at Cape Spear – the Eastern most point of North America! The conference was an awesome place to learn, meet and network with new friends, and catch up with some familiar faces. For Florence and I, our research fit perfectly into the theme of the IMCC conference. Being able to translate results of our work into relevant actions that can lead to improved marine conservation was an amazing feeling. Entering the academic sphere for the first time can be daunting, but the IMCC community was friendly, open and dedicated. Having others outside of our OSU family take an interest in our research truly shows that all of our hard work has paid off. We received great feedback and even some suggestions we could incorporate into our manuscript submissions! Definitely not something to be taken for granted! 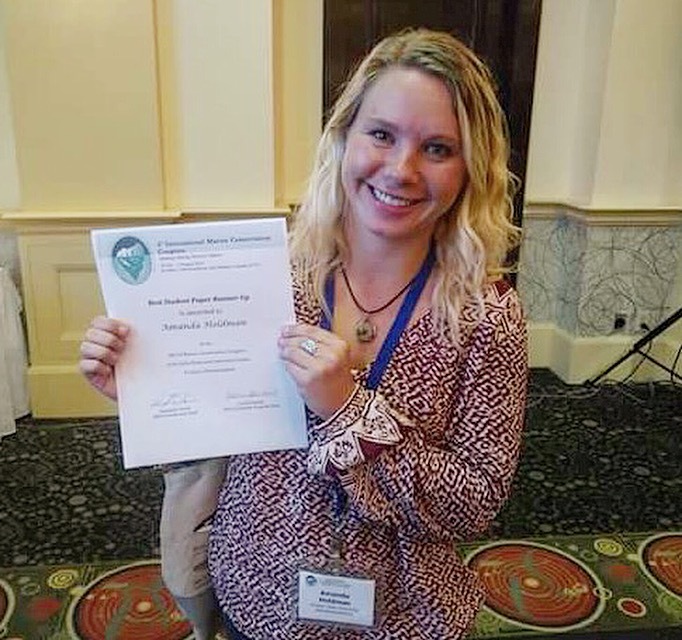 On a more personal note, my talk, “The spatio-temporal distribution and ecological drivers of harbor porpoise off of the Oregon coast” seemed to be well received, I was honored to be awarded runner up for best student presentation by the conference! I would not have received this award if it was not for Leigh, my committee members, OSU, and my lab mates. I couldn’t have been more proud of our lab and the feedback that we received at IMCC. But now, the stress is over, the audience is gone, I’m still riding my high but I’ve found a moment of quietness on the plane ride home to analyze myself. I’ve been to a few regional conferences, and have been lucky enough to attend two large international conferences. However, now that I am nearing the end of graduate school (23 months down, 4 to go), it thus seems like a sensible time to reflect on how to make the most of these trips and experiences. Apart from managing our research projects and scientific writing in graduate school, we are faced with the big challenge of presenting our research to a range of audiences. Oral presentations are one of the most important ways in which we communicate scientific results to other scientists and to be honest, NOTHING paralyses me more than having to present my work – or so I thought. I am no stranger to sweaty palms and a racing heart. Whether it’s 5 people, 50 people, or 500 people – public speaking has always been a gut wrenching experience for me. When it comes to presentations, my flight response is in full swing, and the only thing that keeps me from running away from the presentation is that I would be more embarrassed fleeing than just giving the presentation. However, gradual exposure and better practice over the past couple of years has helped me get over my fear of public speaking. I can’t say that I never get nervous when I have to speak in front of other people, but now my fear is controllable. Now, when I feel myself starting to get anxious I remember that while these feelings are very much real, they do not mean that I cannot give a good talk. The trick for me was learning to be separate from my anxiety by acknowledging it and allowing myself to have that feeling, and then deciding that even with that feeling I can move forward. It took quite a bit of practice for me not to be overwhelmed by these feelings of anxiety – but I’m happy to report that presenting in large groups DOES get easier with practice! So for me, speaking at IMCC granted me with a sense of confidence, perhaps even a career-changing affirmative opportunity. Scouting out your audience or the room you speak in advance, writing your talk well before the delivery date, and practicing it numerous times reduces an enormous amount of pre-presentation jitters. I’ve learned how to manage the jitters in order to give a good presentation. In fact, I think public speaking can even be fun in addition to being a great way to spread your message! Doing a masters (Or PhD) means you constantly challenge yourself and improve your skills. As I continue to encounter new situations and tackle new challenges, I expect that I will go through more cycles of lag and growth as I did with public speaking. I hope that I will have the perspective and patience to appreciate the lag times as integral parts of my development. The IMCC conference was only a snapshot of a major high, but it was an important milestone of my scientific career and personal journey. Here’s a few more pictures from the beautiful St. Johns! Jelly bean row! Eating lunch and overlooking the harbor at Signal Hill. 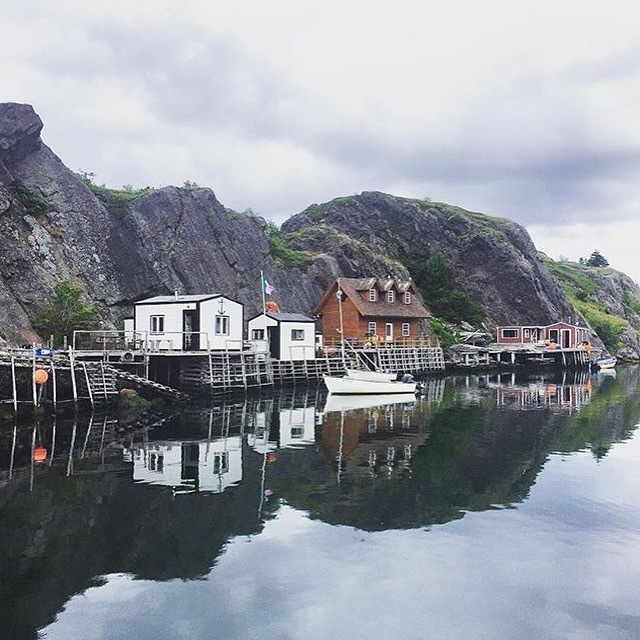 Boat houses at Quidi Vidi Harbour. Posted on August 9, 2016 Author holdmanaCategories UncategorizedLeave a comment on Recapping and Reflecting on the International Marine Conservation Conference! Papahānaumokuākea: soon to be the world’s largest marine protected area? Papahānaumokuākea is a UNESCO World Heritage Site and at the time of its creation in 2006, it became the world’s largest fully protected marine area2. The monument encompasses 140,000 square miles and surrounds the Northwestern Hawaiian Island (NWHI) chain, which extends about 2000 km northwest from the main Hawaiian Islands to Kure atoll (see map below). This monument was originally created through use of the Antiquity Act of 1906, which grants the President of the United States the authority to protect valuable public land through the establishment of a national monument3. The initial letter of request sent to President Obama in January called on the President to use his executive power to expand Papahānaumokuākea marine national monument. This letter of request was put simply. The letter writers believed that as an island boy himself, President Barack Obama understands the importance of the ocean to the people of Hawai’i, especially future generations. This letter and the discussions that have since followed it, emphasize not only the biological value of conserving this large swath of marine habitat, but also the cultural significance of preserving such a place. In the field of marine biology we don’t traditionally think of marine protected areas (MPAs) as “…cultural seascapes that have meaning and significance in the formation and perpetuation of oceanic identity4,” however in the case of the expansion of Papahānaumokuākea, cultural justification is aptly interwoven with biological conservation. The proposed expansion of this marine protected area is especially significant to me for this reason. While I am not native Hawaiian, much of my life is tied to the ocean. My personal life and my current career as a master’s student of marine science are driven by aloha and malama ‘āina. These two concepts are core tenets of Hawaiian culture and they describe a profound love (aloha) and deep respect and sense of caring (malama) for the āina, or land. I have never felt more aloha or such a strong sense of caring for a place than for Papahānaumokuākea. Papahānaumokuākea is a sacred place; a place where the Hawaiian people believe life began. Today, the islands, atolls and the surrounding ocean within the monument continue to create and sustain vast quantities of life, in the form of marine species. The use of the monument is limited to cultural, scientific and educational activities, while activities such as commercial fishing and deep-sea mining are prohibited4,5. One primary benefit of large MPAs is that they improve the state of an ecosystem by supporting sufficient numbers of large and far-ranging predators6. The waters surrounding the NWHI support high numbers of large fish, sharks, marine mammals and seabirds. A total of 7,000 known species exist here, 25% of which are endemic7. The expansion of this monument would mean greater protection for these species, and for important pelagic habitats such as seamounts. Underwater seamounts are biodiversity hot spots and a vast number of them exist outside of the current boundaries but within the limits of the proposed expansion of the monument. Far ranging top predators such as seabirds would benefit greatly from an expanded protected area that would reduce the chance of interactions with longline fishing vessels. The foraging ranges of many of the 14 million seabirds that exist in the monument extend beyond its current boundaries4,8. The Hawaiian longline fishery is especially dangerous for Laysan and black-footed albatross, and hooks an estimated 1,000-2,000 of each species per year9. The Laysan albatross, or mōlī, as it is known in Hawaiian, is the species that captured my attention the most during my time in Papahānaumokuākea. In 2010, I worked for the NOAA/NMFS Hawaiian monk seal research program on Laysan Island. While our work on Laysan was focused on the Hawaiian monk seal, it was hard to miss the energy of the presence of the mōlī. We had the opportunity to observe these birds come to the island to make nests, lay eggs and raise their chicks. The incessant sound of hundreds of thousands of albatross whistling and clicking their beaks at their mates and with their chicks is one I will never forget. You can hear these sounds for yourself in a video that Rachael included in a previous blog post about her time on Midway atoll. On Laysan, I had the opportunity to connect deeply with a natural place and this connection reinforced the feeling of aloha ‘aina. While in the NWHI, we occupied much of our daily life with not only observing and connecting with the wildlife, but also with carrying out conservation activities, such as monitoring the local monk seal population and removing marine debris from beaches. 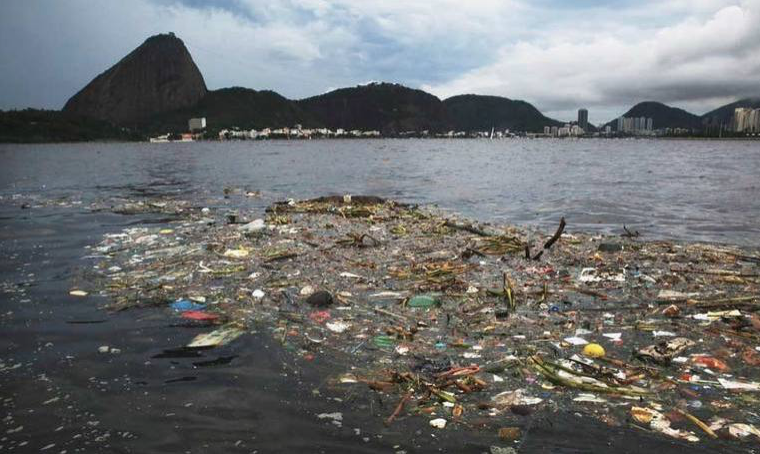 While Laysan is remote, it has not escaped the far reaches of marine plastic pollution (see Rachael’s blog for more on this). Additionally, many of the NWHI are in a perpetual state of restoration and invasive species removal projects. After Laysan, I spent time working on Lisianski Island and then Kure atoll, where we worked tirelessly to eradicate an invasive weed, Verbesina encelioides, and replace it with native plants that we had cultivated. Throughout all of these activities, there was always a feeling that it was our duty to malama ‘aina, to care for and protect these fragile islands and the species that depend on them. A significant amount of momentum has been gained since January, with one important development being a formal proposal that outlines the main points of this request to the President. These include a request to expand the perimeter of the monument to the limits of the U.S. exclusive economic zone, which lies an additional 150 nm beyond its current boundaries. This expansion would more than quadruple the monument’s current size and make it the world’s largest contiguously protected area. The Obama administration has sent delegates to Hawaii to learn more and has intentions to develop an official federal proposal10. While the timeline of this is unclear, a local coalition of community leaders are actively garnering public support to encourage the Obama administration to sign this expansion into law. There was a meeting held last night on Kauai to hear public input regarding the proposed expansion of Papahānaumokuākea and because I was not able to attend I was inspired to write this blog to share my thoughts about why I believe further protection of this monument is a pono (moral, just, righteous) decision. The place-based connection I have with Hawai’i and its surrounding waters are what have guided my career in the fields of marine science and conservation. For me, this connection is with Hawai’i, but for you it may your own hometown, island, backyard or nearby mountain peak. Our love of these places is significant because it facilitates a greater understanding of why they are important to protect. In the field of conservation today, it is especially critical that we foster these types of connections. Preserving wild places, whether they be remote island ecosystems or more easily accessible nature parks, is one way we can ensure that more people have the opportunity to make these connections. 3 “Antiquities Act” Wikipedia: The Free Encyclopedia. Wikimedia Foundation, Inc. 4 March 2016. Web. 2 August 2016. 4 Kerr, J., et al. 2016. PUʻUHONUA: A PLACE OF SANCTUARY. The Cultural and Biological Significance of the proposed expansion for the Papahānaumokuākea Marine National Monument. 6 Edgar, Graham J., et al. “Global conservation outcomes depend on marine protected areas with five key features.” Nature 506.7487 (2014): 216-220. 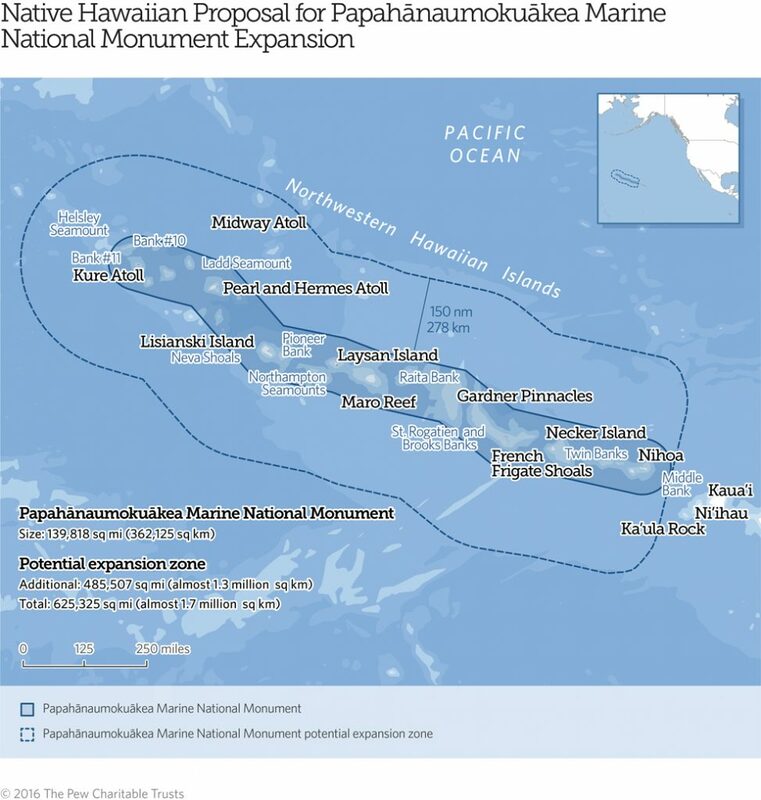 8 Papahanaumokuakea Marine National Monument Management Plan 2008; KE Keller, AD Anders, SA Shaffer, MA Kappes, B Flint, and A Friedlander, 2009. Seabirds: A Marine Biogeographic Assessment of the Northwestern Hawaiian Islands. Posted on August 3, 2016 November 12, 2016 Author Erin PickettCategories UncategorizedTags conservation, Erin Pickett1 Comment on Papahānaumokuākea: soon to be the world’s largest marine protected area?